Busy brides are finding that using wedding planning websites can be quite helpful when organizing and planning a wedding. "How soon should you get started on your wedding website? You should think about starting you personal wedding website no less than 6 months before the wedding. This will give you time to build your site, and your out of town guests time to plan for attending the wedding." Well if you have some web site building experience, you can put one together from start to finish. There are no limits on what you can do as far as design and the content you want to put up. Wordpress or Blogspot. Some brides will start a blog. Using these tools, for some, can be easy to learn and set up. Online wedding planning websites that are already set up to help brides organize their wedding planning. These are the easiest to start and get going. So how do you go about choosing the best one for you? Should you go for a free site or pay for one? The sites you pay for generally offer you more features and tools to keep you organized and help you complete tasks. Your web building abilities. What is your learning curve? How easy is it to start a site? Some take time to build and others are set up in a format with easy to follow steps. Your time. How much time are you planning to spend building and using the website. If you don't have much time, then go with something simple that have the basic tools. The tools you desire. Make a note of the things you want to accomplish with your site. Compare what you need to what the website offers when it comes to the tools they offer you. Now that you have made an evaluation of your abilities and needs, lets look at what you should look for in a good wedding planning website. Choose one that offers a free trail period. You get to try out the site using the tools before committing fully to it..
You should have a large selection to choose from for templates. A large selection of templates give you more options to express your creativity and stand out from other engaged couples using the service. You are able to load videos and pictures. You can share pictures and videos with family and friends. A good site will give you plenty of storage room on our site for this. Planning tools that are easy to use. You should have guest list, gift registry, invitation lists, budgets sheets, address book, etc... A site should offer a variety of planning tools and list to cover all your planning needs. Should offer interactive tools. These tools give your guest the ability to visit and do things on your site, like polls and RSVP tools. Some offer you the ability to have a your own domain name. This makes it easy for your guests to remember and type when coming to your page. You can keep the website for more than 12 months. This is great for those who want to continue to add to the site beyond 6 months to a 1 year. Some services do not offer this feature. Should be able to work with mobile devices. Should be able to view and navigate from your phone or tablet. Look for reviews. Nothing helps like getting a referral or reading a review of others opinions about a service. One thing you may have noticed is that there are so many wedding planning websites to choose from. And to really examine what each offers and compare the features, would take too much time for most busy brides. Why Wedsimple? Simply put... this website meet all of the criteria mentioned above and more! They have loads of template designs to choose from. And enough planning tools so that the DIY bride and the busy bride can plan a wedding with ease! Plus you get to try out all the tools and features during a free 7 day trail period. 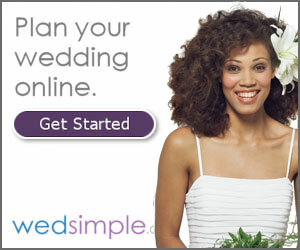 Plan Your Wedding using Wedsimple.com because it has everything you need to plan and announce your wedding. Learn how, when , and where to begin planning your wedding. Find out what you should do and shouldn't do. Keep organized while planning your wedding. Find out which list you should have and the wedding planning books you can use to plan your wedding. You must do this step before buying you wedding gown. Learn what you need to look for in order to buy a dress that will not only fit your budget but look fantastic on you!